The Responsibility Process, derived from field studies, shows how all people mentally process thoughts about avoiding or taking responsibility. It is the core of The Leadership Gift™. Awareness of The Responsibility Process provides a framework for learning by individuals, teams, and organizations. It is the first how-to model for taking, teaching, and inspiring personal responsibility – the #1 principle of success in any endeavor. When something goes wrong large or small (for example, lost keys or a lost retirement account), The Responsibility Process kicks in. The mind offers Lay Blame as a reason. If you accept blame as a sufficient reason, then you will act on that blame. If you don't accept it, then your mind offers you an excuse (Justify). And so on. Thus taking personal responsibility is a step-wise process of refusing to act on a series of irresponsible thoughts that your mind offers up. The Responsibility Process is most useful when self-applied. It backfires when used to Lay Blame on others. INTENTION – Intending to respond from Responsibility when things go wrong. 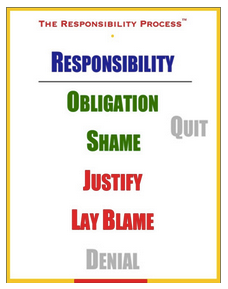 AWARENESS – Catching yourself in the mental states of Denial, Lay Blame, Justify, Shame, Obligation, and Quit. CONFRONT – Facing yourself to see what is true that you can learn, correct, or improve. Use the form (top right) to download, print, and post a copy of The Responsibility Process poster where you will see it frequently. It will surprise you how seeing it supports your intention, your awareness, and even your ability to confront. Try it.